Never did I think I would struggle like I do now to keep my boys, especially the teens full. They are literally always hungry. Doesn’t matter if they’ve eaten lunch, and then second lunch because I’m in the kitchen cooking. Without fail, around 30 minutes later they’re whining they’re hungry. It’s not a normal hunger either, it’s a persistent gnawing at their gut and grating on my nerves hunger that won’t abate for any of us. I remember being hungry as a teen, and my Mom didn’t buy junk to keep on hand to fill us up. There was always plenty at meal time’s to fill us up. Still I do remember those days when, doubling up on Varsity sports in one season, an apple and some peanut butter to dip it in wasn’t enough to fill me up after practice. I got creative and would microwave a bowl of water until it was piping hot and then throw in a handful of pasta and bouillon cube and let it all steep. It was simple and actually pretty perfect in between all the practices. My kids aren’t doing anything of the like though this Summer. They’ve got this funky combination of ravenous teen and bored boy going on, creating a vacuum of hunger staring down my pantry. Trial and error has proven though that the snacks they want– like the giant economy sized jar of cheese balls– doesn’t actually do anything to help the problem, for either of us. One thing we can all always find common ground on? Dessert. A snack that tastes like dessert? Now that’s a win for all of us. Plus this guilty little pleasure has the added advantage of being relatively healthy, while tasting sinfully sweet. 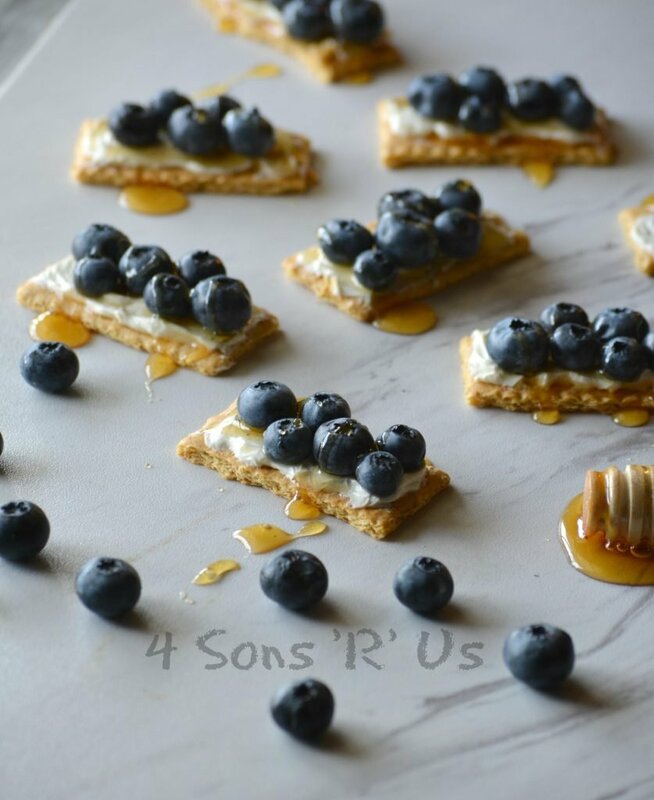 Graham crackers spread with whipped cream cheese, topped with fresh blueberries and a sweet drizzle of fresh honey. In one tiny little package, my kids are getting full and they’re also filling up on calcium, antioxidants, and vitamins. It’s the perfect afternoon energy boost. Who needs guilt when you’re hungry. Certainly not the parent in us. 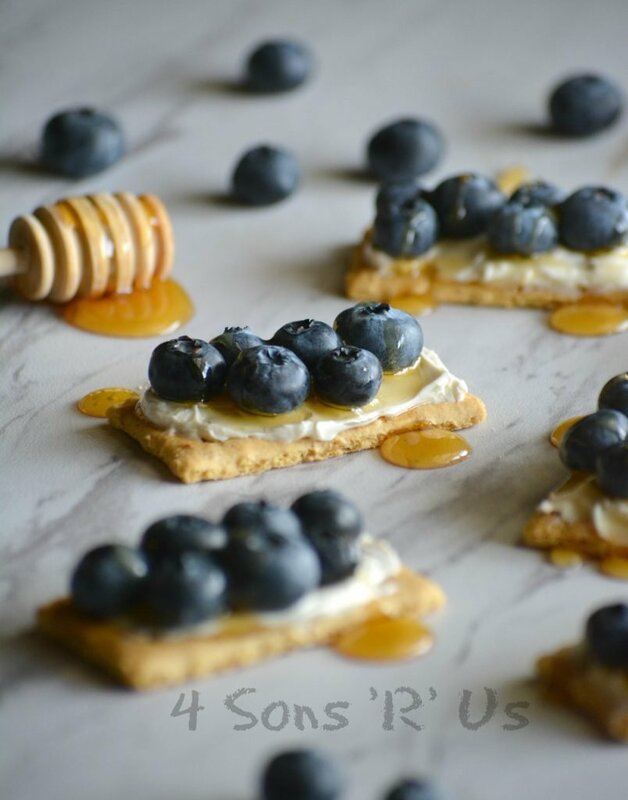 Serve your family a snack you can all feel good about eating and enjoying with these tasty little Blueberry Cheesecake Snack Bites. They’re simple to throw together, even when you’ve only got minutes to spare. Grab one, grab a handful, just make sure if you’ve got some hungry boys like I do– make enough to share! A healthy bite to eat that's tastes like dessert but also passes for a perfectly acceptable, delectable snack or breakfast. If desired, whip the cream cheese-- not only does this make it easier to spread, but it also makes it lighter, fluffier, and richer tasting. 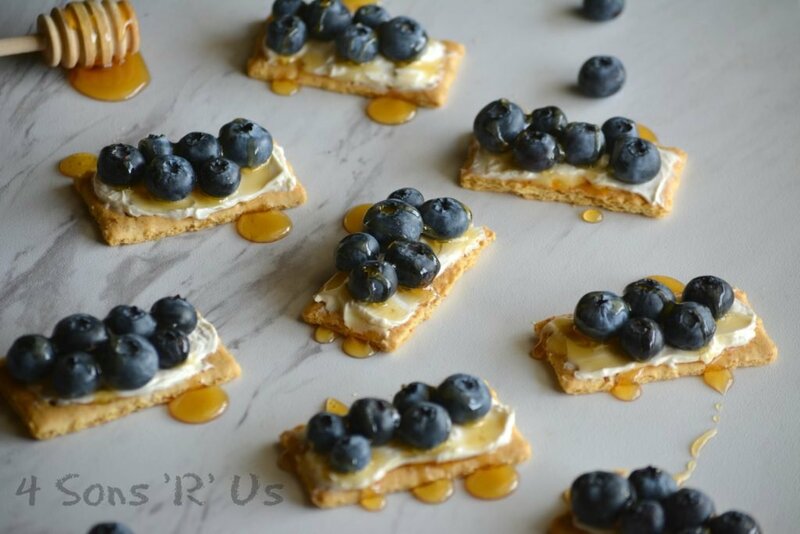 Spread the cream cheese out liberally onto each graham cracker slice. 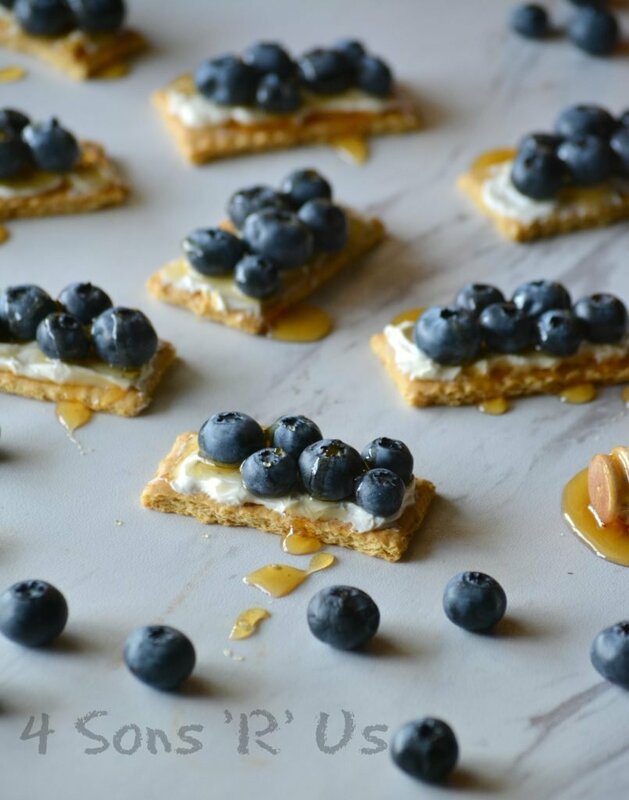 Add 4-5 blueberries to each graham cracker slice. 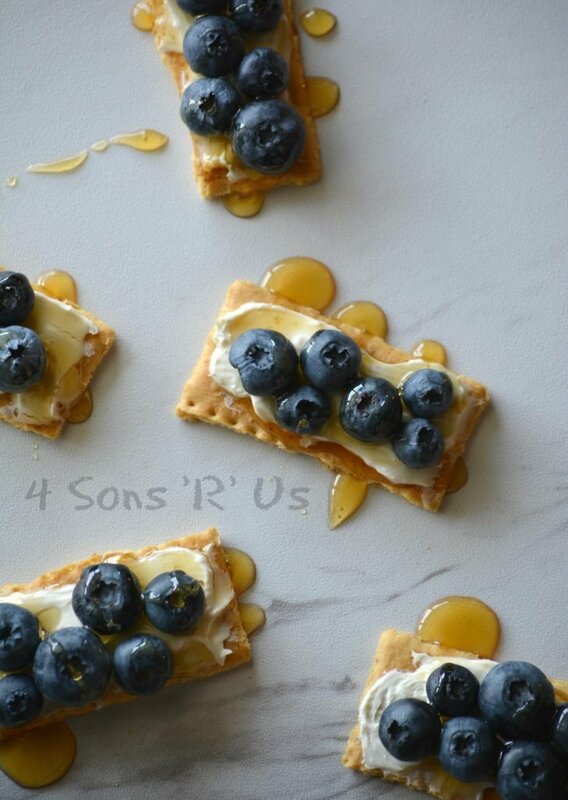 Drizzle each assembled cracker with honey. Don't like blueberries, or have some other fresh fruit in the fridge? This recipe is easily adaptable. Terrific idea! So glad you shared with us at Weekend Potluck. Please come again soon. Thank you, and I was happy to be there! Darling and perfect for after school snacks – well for just about anytime! Thanks for sharing with us at Throwback Thursday! Yep, after school snacks, after lunch snack, before lunch snack, dessert. Anytime’s pretty much a good time for these yummy little snack bites.